Once to this step within the myHEALTHware Setup Wizard, SOAPware will display a listing of all active users in your SOAPware system. Using the drop down menu located next to each user name, select the appropriate role for the staff member. The staff member's role will define the security permissions that they have when logged into myHEALTHware. These security permissions can be edited by the myHEALTHware administrator when logged into myHEALTHware. For instructions on editing security permissions related to each role, please see: Role Management. 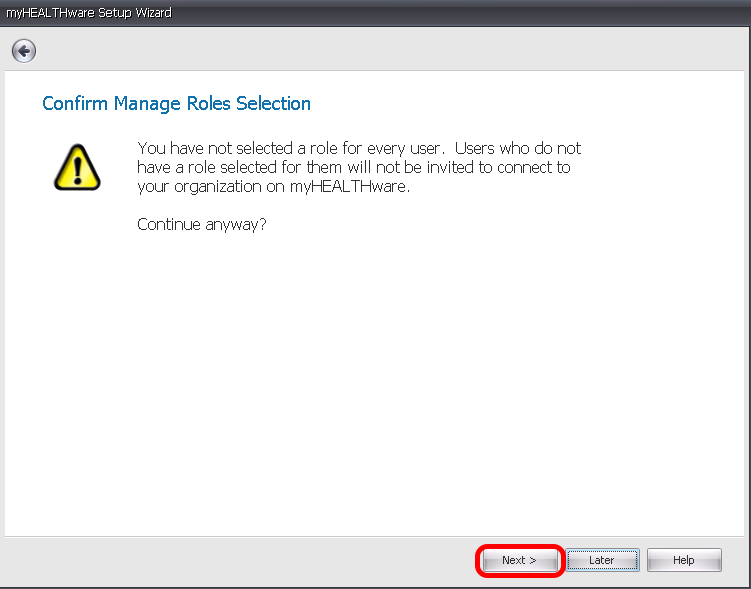 *Note: If there is a user listed that you do not wish to have access to myHEALTHware, simply do not select a role for that user (leave the selection as "Not Selected"). If you do not select a role for all of your users, you will be prompted to verify that you would like to continue. Click Next to continue. *Note: You will be able to assign roles for users at a later time if you wish to do so. Congratulations! 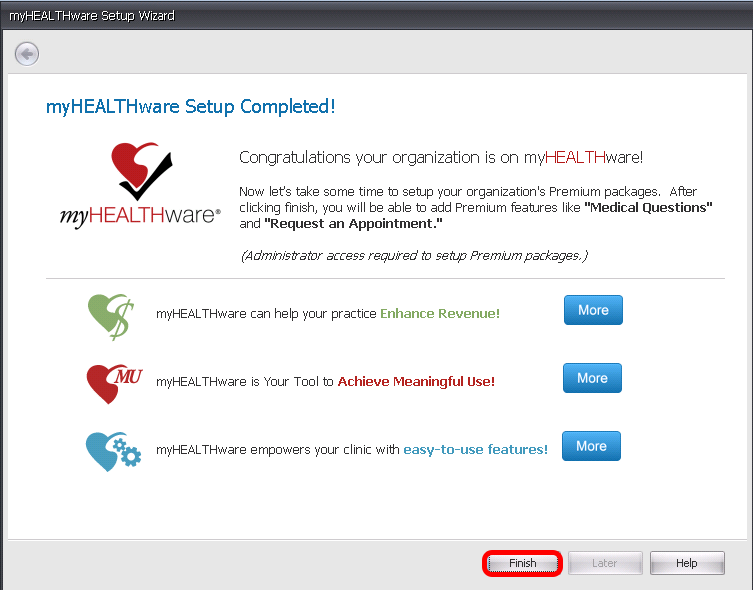 You have completed your myHEALTHware User and Organization Setup! As each of your staff members log in to SOAPware, they will be be introduced to myHEALTHware, and SOAPware will prompt them to create their myHEALTHware account. myHEALTHware will connect these accounts to your organization in the staff role that you selected for them. This is a one-time set up after which SOAPware will connect them to their myHEALTHware account. For instructions on completing the Staff Member Account Setup Wizard, please see: Staff Member Account Set Up Wizard. After clicking the Finish button, SOAPware will log you into your myHEALTHware account and take you to your organization's Manage Subscription settings. From here, you can optionally set up a Premium Package with features like Medical Questions and Request Appointments, to offer to your patients. A premium package allows you to generate revenue for the tasks your clinic might already perform. Of course, offering premium services is completely optional and determining a price for services is at your discretion. As myHEALTHware grows, we will introduce additional features for your organization to offer to patients. The next step will ask you to set up your myHEALTHware Annual Subscription Amount and Billing Agreement. For instructions on setting up your Annual Subscription Amount and the Billing Agreement, please continue to Step 7. To continue to the next step, please click the following link: Set Up the Clinic's myHEALThware Subscription Price and Billing Agreement.